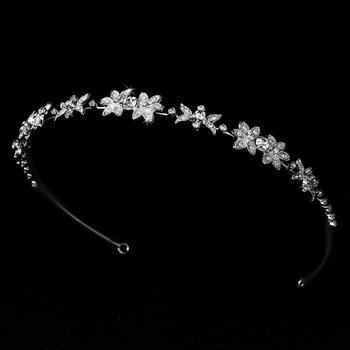 Delicate and floral, this rhinestone piece is the ultimate in simplicity. Perfect for the bride, bridesmaid, or flower girl. The ornamented portion of the piece measures 9-1/4" wide and 1/2" tall, and the piece ends in a loop at either end that allows you to fasten it in your hair with bobby pins.